Track Man lumbar cushion is automatic inflatable, and you can also inflate by your mouth quickly. 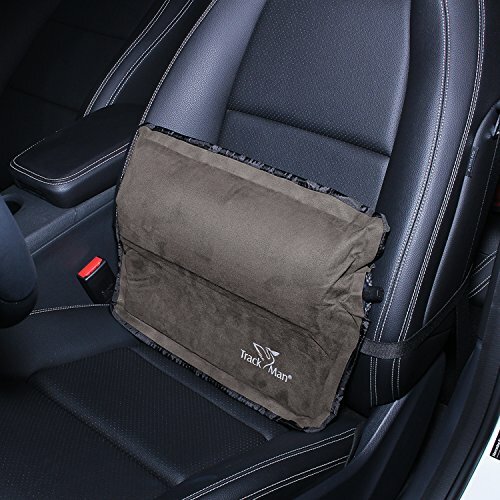 Track Man lumbar cushion support provides a great combination of both comfort and support. The lumbar cushion is designed to counter to the curves of your back to give you a custom fit. The back support cushion's medium firmness easily supports the spinal curve and makes sitting more comfortable. Open the nozzle cap. Roll up from the other end of the air cushion, press out the air, tighten the nozzle cap and then pack the cushion folded or in straight roll. You can reduce the collection volume by multiple exhaustion. Please put in the outer bag to avoid scratching while carrying it. If you have any questions about this product by Track Man, contact us by completing and submitting the form below. If you are looking for a specif part number, please include it with your message.